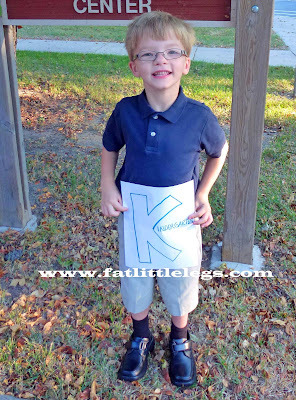 Today was my "baby" boy's first day of Kindergarten! It is unbelievable to me that 5 years ago tomorrow (September 5, 2007), after 27 days in the NICU we finally brought him home for the first time from the hospital! He was a mere 4 lbs 5 oz the day he was discharged. I can see it all in my mind still when I close my eyes! In the first 5 years of his life, there have been so many firsts. And today was yet another first, and another reminder to his mama that time passes so quickly when we aren't really paying attention. I barely will have time to wipe the tears from my eyes, and I'll be celebrating another first - Lily's first birthday in a week and a half. Right before my very eyes, my baby girl is turning into a toddler. So tonight, my heart is swelling with pride at the amazing first that happened today, and the amazing first that will happen in less than 2 weeks, but at the same time my eyes are filled with tears. Life, so amazing! Life, so blessed! Life, so fleeting.